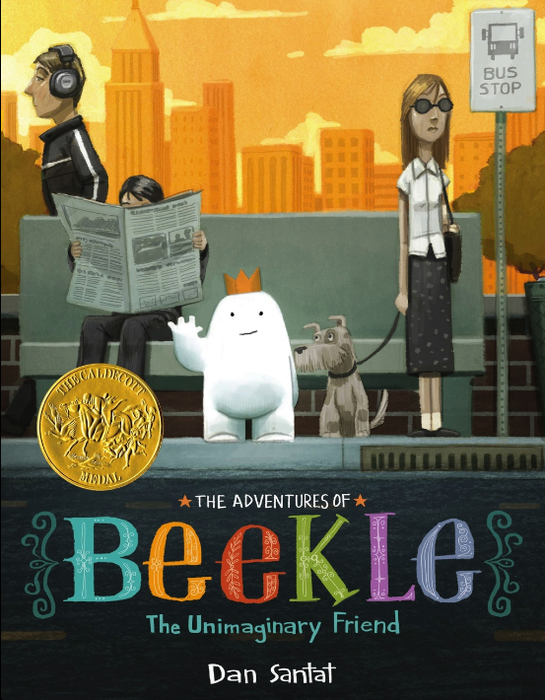 Beekle is an unimaginary friend who is waiting for a child to imagine him. He waits and waits in the land of imaginary friends, but still no one imagines him and brings him to the real world. 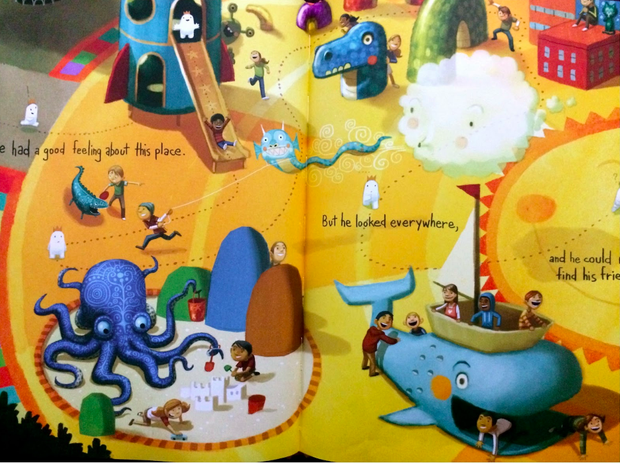 So he does the unimaginable... Beekle travels to the real world in search of a friend to call his own (Santat, 2014). 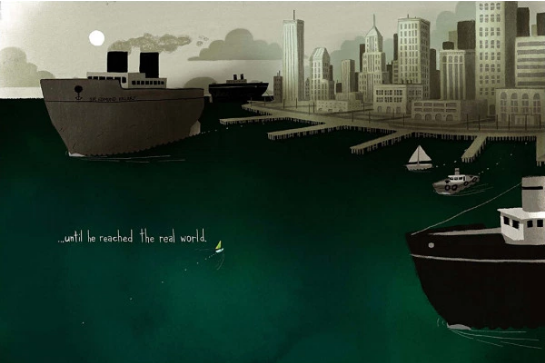 The illustrations expand on what the words explain to help add more meaning to the story. 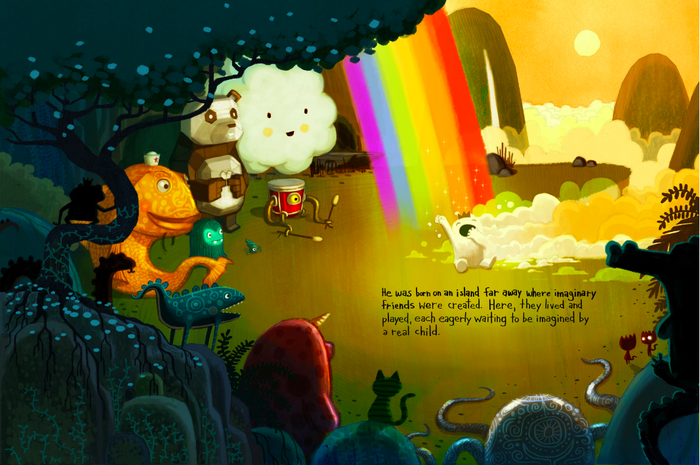 Since the story takes place in an imaginary world, the pictures help to illustrate just how imaginative that world is. Characters and setting are also beautifully illustrated to show readers exactly how the author imagined this world. 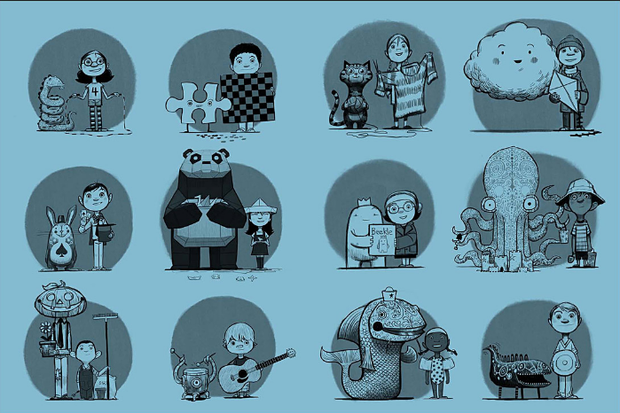 The end papers show children with their different imaginary friends, including Beekle and his new friend Alice. Each child matches their imaginary friend in some way, making a complimentary pair. The book is produced in a larger size with thick paper that doesn't cut easily, making this book more child friendly. The illustrations perfectly show the juxtaposition between the real and imaginary world. The imaginary world is bright and fun, and the illustrations use bold colors and textures. On the contrary, the real world is dull and drab. It is mostly colored in shades of grey, with one exception: anything to do with imagination or fun is portrayed in color. For example, music coming from the subway station and the child's playground are a few colored elements in the real world. The text is also written in a fun font which adds to the entertainment of the story. 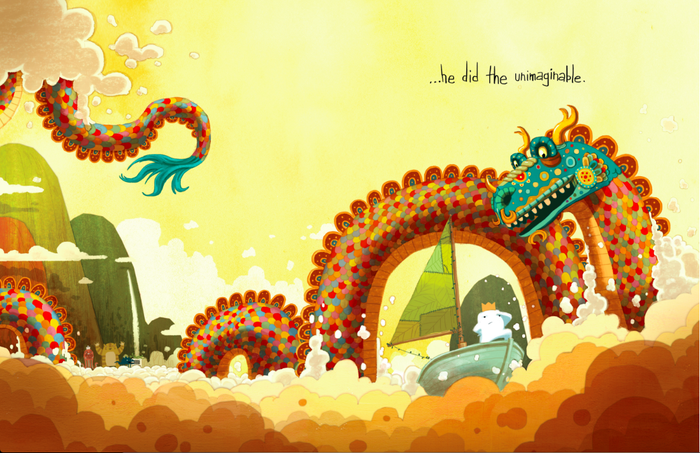 "The Adventures of Beekle" is illustrated in a surreal style which helps to add the imaginary feeling of the book. It helps make the book larger and life, just like how a child would truly imagine. The bright colors are what initially draw in the audience and make them excited to follow through the story. The surreal style also helps to connect audiences of all ages because most people have had an imaginary friend at some point in their life. The illustrations are made digitally which can help the pictures look clean and put together. However, the lines are not always perfect because this is an imaginary world where anything is possible. 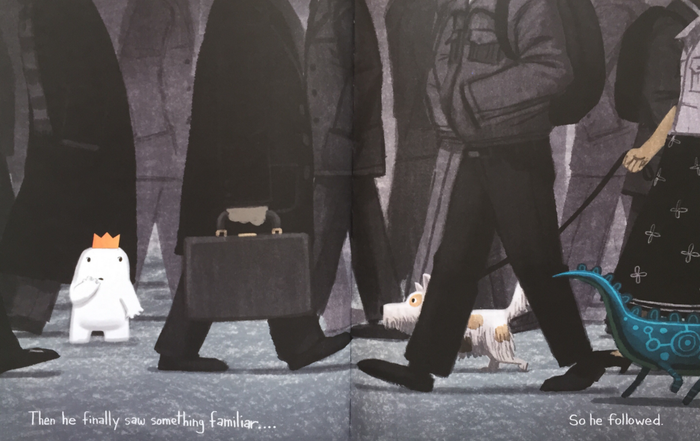 The author/illustrator exhibits a wide range of illustrations, from eye popping imaginary friends to dark and boring city life (Reamer, 2014). The illustrations always take up the whole page, with no borders involved. The text is also within the illustration rather than in it's own box. This helps readers feel more connected with the story. Since readers do not have to take their eyes of illustration and do not have to break that concentration, it gives the illusion of staying within the storybook world. The text moves throughout the book, going from the top of the page, to the bottom, to both, or even diagonally across a double page spread. This makes the story seem more interactive for the reader. The text and the illustrations have an enhancing relationship, meaning that the illustrations "extend" the meaning of the text (Harmon & Martinez, 2012). Without the words it would be difficult to make meaning out of the story. The illustrations help to elaborate on what the text is saying and really give an idea of how imaginative this world is. Without the illustrations the reader would have no idea the difference between the colorful imaginary world and the drab real world. I highly recommend reading this book and sharing it with any young children in your life. The amazing artwork single-handedly drew me into the story and made me fall in love. 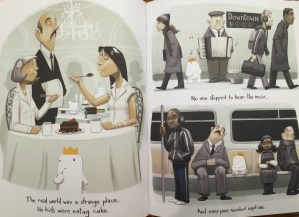 Beekle is an adorable little marshmallow that every child should get to know. Reaner, J. (2014, January 27). 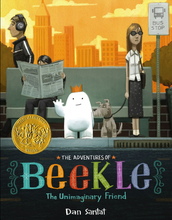 The Adventures of Beekle: The Unimaginary Friend [Review]. Publishers Weekly.